The Bullet Blitzer viewed from the front as it flies in the Gun the Runner minigame in Mario Party 8. 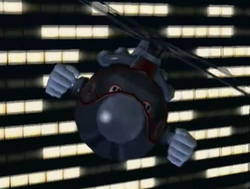 The Bullet Blitzer is a small battle helicopter shaped like a Bullet Bill from the game Mario Party 8. It appears in a 1-Vs.-3 minigame called Gun the Runner. The helicopter itself has two rotors with four blades each, and is piloted by two Shy Guys from the cockpit on the front. The semicircular panels that cover the entire back section of the helicopter are capable of opening upward on either side, revealing the inside of the helicopter and allowing a retractable platform to emerge from the left side. 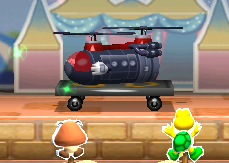 The helicopter also features circular windows, three on each side, two clenched fists (like a Bullet Bill), one on each side, and an escape hatch door on the back. 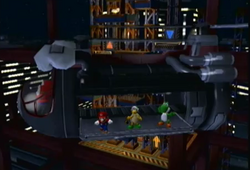 Mario, Hammer Bro, and Yoshi celebrating inside the Bullet Blitzer after winning the minigame. Before the Gun the Runner minigame starts, the Bullet Blitzer flies through a nighttime cityscape until it reaches the top portion of a building that is under construction. As the Bullet Blitzer stops and hovers in front of the building, the back portion of it opens up, revealing three characters equipped with ball-launching guns standing on its retractable platform. When the minigame begins, the camera turns to face the building, and the three players standing inside the Bullet Blitzer must attempt to prevent the fourth player on the building from reaching the top by continually launching balls at them. While the actual minigame is going on, the Bullet Blitzer cannot be seen. If, at the end of the minigame, the three players inside the Bullet Blitzer have successfully prevented the fourth player from reaching the top of the building, then the back portion of the helicopter will remain open and the three characters inside will each do their respective victory pose as the helicopter gradually flies away. If, however, the fourth player is able to reach the top of the building in time, then the fourth character will do their victory pose on the building, the Bullet Blitzer's platform will retract, and the back portion of it will close as the three losing characters sulk inside. The Bullet Blitzer later appears during the end credits, where two characters are seen inside it. The Bullet Blitzer's Carnival Figure, as seen during the Carnival Parade in the Carnival Wagon of the Fun Bazaar. A Carnival Figure modeled after the Bullet Blitzer also makes an appearance in the Fun Bazaar. The player can purchase it from the Surprise Wagon for 30 Carnival Cards, after which it can be viewed in the Carnival Wagon; either on a shelf with the other Carnival Figures that the player has purchased, or in the Carnival Parade. If the player clicks on the Bullet Blitzer during the Carnival Parade, it will take off from its platform, hover in the air while its back portion opens up - allowing several Goombas to jump out from inside it, and then land back on the platform again. This page was last edited on March 18, 2018, at 21:10.